A Gantt chart or project schedule includes a list of tasks on the left and horizontal bars on the right showing when the tasks begin and end. In the Gantt chart below, the task "Do Initial Design" begins January 2nd and ends January 6th. In this Gantt chart, the smallest increment is one day. You can also draw charts with one hour, week, or month being the smallest incremental value. You may want to print this page and follow along as you create your first Gantt chart. In RFFlow click Tools, Auto Charts, and Enter Gantt Chart Data. The RFGantt program will run. A screen shot of RFGantt is shown below. This feature is included in both the free trial version of RFFlow and the full version. If you are drawing a lot of Gantt charts, you may want to add the Draw Gantt and Edit Gantt buttons to your RFFlow toolbar. To do this, click View, Toolbars, and customize the bottom row. To add a task, click the Add Task button in RFGantt. The Add Task dialog will appear as shown below. Click the Task tab if it is not already selected. In the Task: box, enter your task. For example, type "Do Initial Design." You do not need to number the tasks. This will be taken care of automatically. 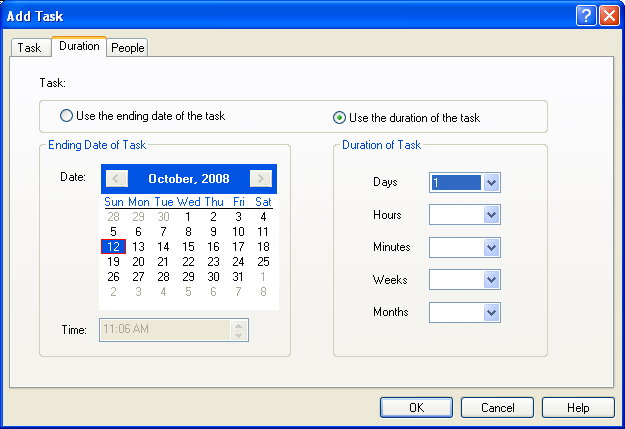 Select the starting date for the task. This includes the year, month, and day the task begins. To change the year, click on the year and then click the small triangle pointing up or down to increase or decrease the year. To change the month, click on the triangles pointing left or right to select earlier or later months. To select the day, click on the day. The current day will be highlighted. To change the time, click on the time and then click on the up or down arrow. Next click the Duration tab to fill in the duration as shown below. You can specify the duration of the task or the ending date of the task. For example, if the task takes one day, you would click the round button near Use the duration of the task and put a 1 in the Days box. To specify the ending date, click Use the ending date of the task and then select the ending date on the calendar. After entering a duration, click the OK button and your task will be listed. Right-click on a task in the main screen of RFGantt if you want to delete it, move it up or down in the list, or edit it. 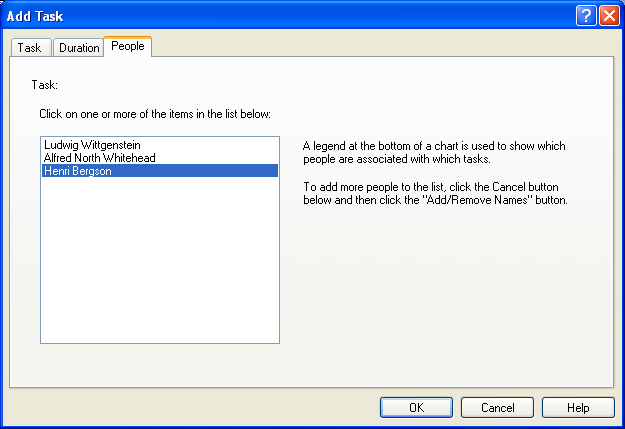 You can add a title to your chart by clicking Tools in the main menu of RFGantt, Options, and the Add Title tab. The title will be added to the chart when it is drawn in RFFlow. After entering all the tasks, you need to save this data in a file on your hard drive. 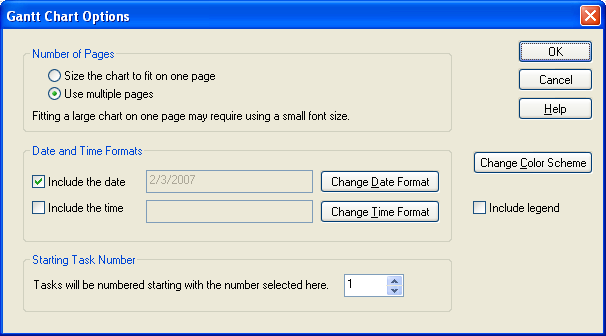 Click File in the main menu of RFGantt and Save in the drop-down menu. The Save As dialog box will appear. You need to save your data so you can import it into RFFlow to create a Gantt chart. You may also want to edit the data later adding tasks or changing dates. The folder where your data will be saved is shown to the right of the words Save in:. Remember where you saved the file so you can find it again in step 6 below. Type the name of the file into the box near the words File name:. Just type the file name. The extension .txt will automatically be added. 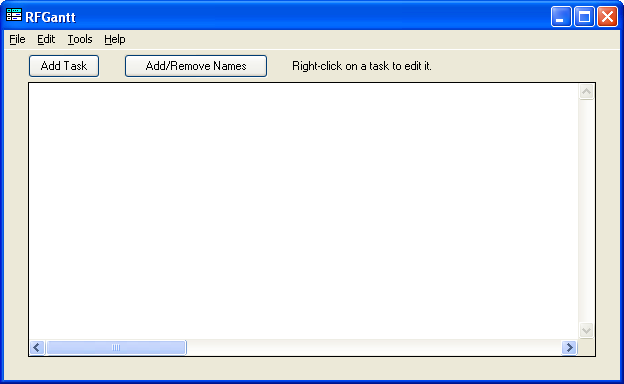 The files used by RFGantt are text files like those created with Microsoft Notepad. After saving the data in a text file, you then import the file into RFFlow. RFFlow creates the Gantt chart. In RFFlow, click Tools, Auto Charts, and Draw Gantt Chart or click the Draw Gantt button if you have added it to your toolbar. The Gantt chart data was saved in a .txt file. You have to be able to browse to the folder where you saved your file in step 4 and open it. The Open dialog box will appear. The folder whose contents are displayed is listed to the right of the words Look in:. To change folders, click on the triangle pointing down and choose a new folder. You can move up one level in the hierarchy of folders by clicking . Once you are displaying the correct folder, simply click on the file and click the Open button. You can create a Gantt chart that displays in hours, days, weeks, or months. You may want to try different units. In general, the larger the unit of time, the smaller your chart will be. Hours are used in making a work schedule chart. Instead of having a list of tasks on the left, you have a list of workers. The bars show when a worker begins and ends their shift. Weeks or months are used if you have tasks that last a long time. You could use days instead of months as the time increment, but that would result in a chart of several pages or a one page chart with a very small font. All Gantt charts must have a list of tasks on the left, but the other columns are optional. You can show or not show the ID number for each task, starting date of each task, ending date of each task, or duration of each task. A check mark means that the column will be shown. The advantage of not showing all this information is that you can make the Gantt chart smaller so it is more likely to fit on one page. There are a number of ways to customize your Gantt chart. Number of Pages - If you try to fit a large chart on one page, the font will become very small making the chart hard to read. You may want to try one page at the start and then switch to multiple pages if that doesn't work. Date and Time Format - In the Start and Finish columns, you can decide to display the date and time and how they are formatted. Starting Task Number - If you have a big chart with over 25 tasks, you should split it into two files or the font will be very small. If you split a Gantt chart into two files, then you will want the numbering on the second file to start at the next task number. For small charts, this value is always left at 1. Change Color Scheme - This allows you to select a color scheme for your Gantt chart. In the list of color schemes, the next to the last scheme is the one shown in the sample below. It is blue with orange task bars. Include Legend - If you associate people with a task, then you will want to include a legend. This is explained later in this section. After clicking OK in the dialog box above, RFFlow will draw your Gantt chart. At the end of this process, you will end up with two files. One is the text file (.txt) where you saved the data. That file was generated by RFGantt. The other file is the RFFlow file (.flo) which contains the actual Gantt chart. Both should be saved as you may want to edit the RFGantt chart data and generate another slightly different chart. There are two ways to edit your Gantt chart. 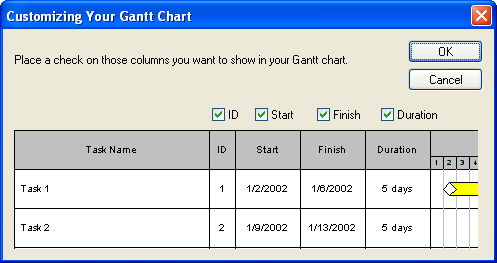 You can open the Gantt chart data file (.txt) and make changes to the data. Then you have to generate the chart again in RFFlow. To do this, run RFFlow and click on Tools, Auto Charts, and Enter Gantt Chart Data. The RFGantt program will run. In RFGantt, click on File, Open, or click on File and click on the name of the file you want to open. The last 9 files you opened are listed at the bottom of the File menu. You can also make edits to your Gantt chart in RFFlow. You can edit it using all the editing features of RFFlow. It is just like any other chart that you draw in RFFlow. You can edit the text, add more text, delete shapes, move shapes, add lines and change colors as usual. RFFlow is unique in that the finished chart can be fully edited. You may want to use white task bars to place over the colored ones. The white task bars are located in the Gantt Charts stencil. Click , Gantt Charts, and the Add Stencil button. The colored area shows how much of the task is completed. You can associate people with each task. For example, if the task is to "Write Business Plan" and Henri Bergson is responsible for writing the plan, the final Gantt chart would list the task as "Write Business Plan (C)" and in the legend there would be an entry "C. Henri Bergson." This allows you to see what people or groups are associated with each task. The first step in associating people with a task is to enter the people. In RFFlow, click on Tools, Auto Charts, and Enter Gantt Chart Data or click the Edit Gantt button . In the RFGantt program, click the Add/Remove Names button . The dialog box shown below will appear. To add a name, type the name in the box to the left of the button Add New Name and then click the Add New Name button. The name will be added to the list at the top. The names are arranged in the order they are added, but you can change the order or put them in alphabetical order. To move a name up, click on it and click the Move Up button. If you want the names sorted by last name, type the last name first, e.g. Washington, George. 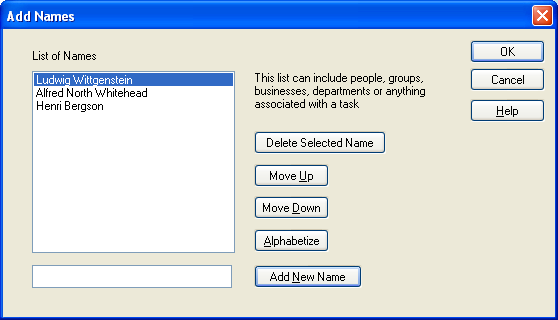 You can use names of groups, departments, divisions, etc., or names of people. To remove a name, click on the name in the list of names to select it. Then click the Delete Selected Name button. You can only delete one name at a time. The only way to edit a name is to delete it and add it again. When you delete a name, it will also be removed from any task to which it is connected. When you are done adding or removing names, click the OK button. The next step is to associate a name with a task. To edit a task in RFGantt, right-click on the task and select Edit Task. The Add Task dialog box will appear. Click the People tab. Click on those people who you want associated with the task. To select a person, you click it. If you want to remove the selection, click it again. You can click on more than one person. In the picture above, Henri Bergson was selected. Do this for each task. In the RFGantt program, click Tools, Options. Then select the Time Format and Duration tab shown below. Time Format - If you are measuring a task in days, you probably don't want to include time and should click No time. If you want to enter time data, then you can select to enter it in an AM, PM format or in a 24-hour format. This selection applies to data entry in RFGantt. When you generate the chart in RFFlow, you can make different selections. 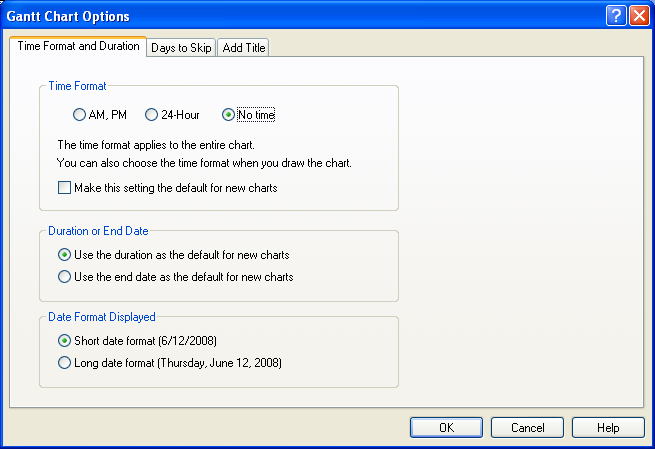 Duration or End Date - This simply sets up the default selection. You can select the duration or the end date as the default for new charts. 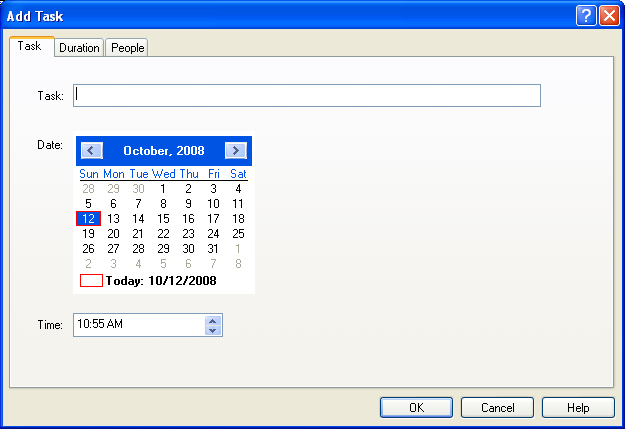 Date Format Displayed - In the main screen of RFGantt the date can be displayed in a short or long format. You select that format here. When you generate the chart in RFFlow, you can select a different format for the date and time. This selection only affects RFGantt. In the RFGantt program, click Tools, Options. Then select the Days to Skip tab shown below. You may want to skip and not count days such as Saturday, Sunday, and holidays. For example, if your business does not work on the weekends, then a task that starts on Friday and takes 2 days will end on Monday. The two working days are Friday and Monday, while Saturday and Sunday are skipped and not counted. 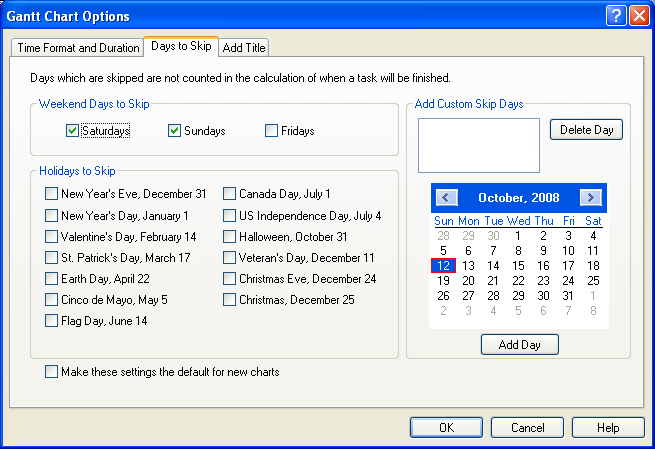 There is also a section where you can set up a custom list of days to skip or to add holidays that are not listed. A Gantt chart using weeks or months ignores the skip days and does not skip any days. If you specify the ending date of a task, then skip days are ignored. The Add Title tab allows you to add a title to your Gantt chart.